Please use the eardrops in each ear with a new tube for the next 7 days. Use the drops as prescribed by your doctor, placing the drops into the outer opening of the ear canal, with the head tilted to the opposite side. After putting the drops in the ear canal, "pump" the drops into the ear by pushing three times on the small bump of cartilage in front of the ear opening (the tragus) to cover the ear opening. The tragus will cover the ear opening like a "trap door" and will provide a seal that will produce a small amount of gentle positive pressure in the ear canal. This maneuver helps to "pump" the drops through the tube and into the middle ear. Place a clean piece of cotton into the ear after using drops. A small amount of blood tinged drainage is not uncommon for several days after tubes have been inserted. Nausea and vomiting may occur during the first 6 hours after the operation. Offer liquids initially. If there is no nausea, small light meals are usually best tolerated the day of surgery. A normal diet may be resumed once nausea has passed. The patient may experience mild ear discomfort the day of surgery, which is usually relieved by Tylenol® or ibuprofen. Increased irritability is common for children for 2-3 hours after a general anesthetic. Some children will sleep longer during a morning or afternoon nap than usual. The majority of children will be well by 6 pm. A small amount of clear or blood-tinged drainage from the ears may occur a few days after the procedure. If drainage should persist or become thick, green, yellow or foul-smelling, please contact our office. If you see clear, green, or yellow drainage from your child's ear during colds, clean the outer ear gently with a soft, damp washcloth. Begin the prescribed eardrops 3 times a day for one week, as previously instructed. 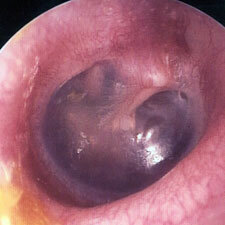 The drainage should stop within 48 hours after starting the ear drops. If the drainage continues or becomes yellow or green, please call our office. If your child develops a fever greater than 102oF or has any persistent bleeding from the ear(s), please call us. Try to avoid getting water in the ears. Swimming is permitted as long as there is no deep diving or swimming underwater deeper than 3 feet. If you think that water has gotten into the ear(s) either bathing or swimming, place 3 drops of the prescribed eardrops into the ear in question. We do recommend drops after swimming in rivers, lakes, or the ocean if you think that water has entered the ear canal. When bathing or washing hair, you may block the opening of the ear canal with a cotton ball. Cover the outer portion of the cotton ball with a thin film of Vaseline® so that a seal is formed and water cannot enter the ear. Alternatively, you may use silicon earplugs to accomplish the same purpose. It is important for you to return for your scheduled appointment so that the status of the tubes can be determined. Please use the Otovel® or Ciprodex® ear drops, or other drops that were prescribed, in each ear for the next 7 days. Instill the prescribed number of drops into the ear canal. After putting the drops in the ear canal, "pump" the drops into the ear by pushing three times on the small bump of cartilage in front of the ear opening (the tragus) to cover the ear opening. The tragus will cover the ear opening like a "trap door" and provide a seal that will produce a small amount of gentle positive pressure in the ear canal. This maneuver helps to pump the drops through the tube and into the middle ear. Place a piece of clean cotton in the ear. Use the drops 3 times ( or as prescribed) per day for the next 3 days, and then stop. A small amount of blood-tinged drainage is not uncommon for several days after the tubes have been inserted. If you should see green or yellow drainage coming from the patient's ear(s) during colds, begin 3 drops, 3 times a day for 7 days. Clean the outer ear gently with a soft, damp washcloth. The drainage should stop once the cold is over. If the patient develops a fever greater than 102oFor has any steady bleeding from the ear(s), or it is not improving please call our office. If you think that water has gotten into the ear(s) during either bathing or swimming or the patient complains that water has gotten into their ears, instill the prescribed amount of the drops into the ear canal in question. Routine swimming is permitted as long as there is no deep diving (more than 3 feet under the surface). The patient may have a low grade fever (below 102o) and/or have some self-limited nausea or vomiting the day of the operation. Continue clear liquids until the nausea/vomiting stops. You may give liquid or chew-able Tylenol® every 4 hours for fever or pain or liquid ibuprofen every 6 hours for pain . If the fever should rise above 102o F, please call our office. Please check with our office before administering any other medication to the patient that was not prescribed by our doctor during the 3-day postoperative period. Many children will be sleepier during the morning or afternoon after the procedure and may take a longer nap than usual. By 6:00 p.m., they are usually behaving normally. Please make an appointment (if one has not already been made) to see Dr. Kraus in 1 month for a brief tube check and hearing test. The tubes should remain in place for 6 months to 1 year. A follow-up hearing test will be performed at the 1-month visit. Please do not hesitate to call us at (336) 273-9932, if you should have any questions. Young children who are primarily splashing and do not place their heads underwater do not need to take any special precautions. If the parents or child feels that water has gotten into the ear(s), place 3 drops of Otovel® or Ciprodex® (as prescribed), or other prescribed eardrops, in the affected ear(s) at the end of the swimming session. Older children who are swimming more than 3 feet underwater should wear fitted earplugs. You may purchase sized earplugs or silicon earplugs at most pharmacies or in our office. Soft silicone earplugs should not be pushed deeply into the ear canal. Apply a fine coating of Vaseline® around the plug to improve the seal. In unusual situations where it is difficult to get a good fit with standard earplugs, custom-fitted plugs may be purchased through our audiology department. Never use "Silly Putty" as an ear plug. "Silly Putty" melts at body temperature and is very difficult to remove from the ear canal and eardrum. Only use plugs that were designed specifically to be placed safely in the ear canal. If you have any questions concerning what type of ear plug to use, please contact us. We do not recommend that children with ear tubes put their heads underwater in untreated rivers, lakes, or ocean water because of the risk of infection. Small children should wear earplugs even if they are just splashing in the shallow, dirty water. If water accidentally gets into the ear(s), place 3 drops (as prescribed) of Otovel® or Ciprodex®, or other prescribed drops, in the affected ears. Children with an active ear infection should not put their heads under water. Children with ear tubes should not use any type of swimmer's ear drops or preparations, nor should they use any type of eardrops other than those prescribed by our physician.